Following the great experience of the 2015 Design Workshop , the three participating schools (University of Detroit Mercy School of Architecture, University of Illinois Urbana-Champaign and the Warsaw University of Technology) are returning to Volterra in July 2016 for the 2nd Volterra International Design Workshop. The objective of the workshop will be to propose a contemporary re-interpretation of the role of the historical city gate in the urban context. The design effort will focus on the place defined by the gate itself, as well as the urban space immediately in front of it. 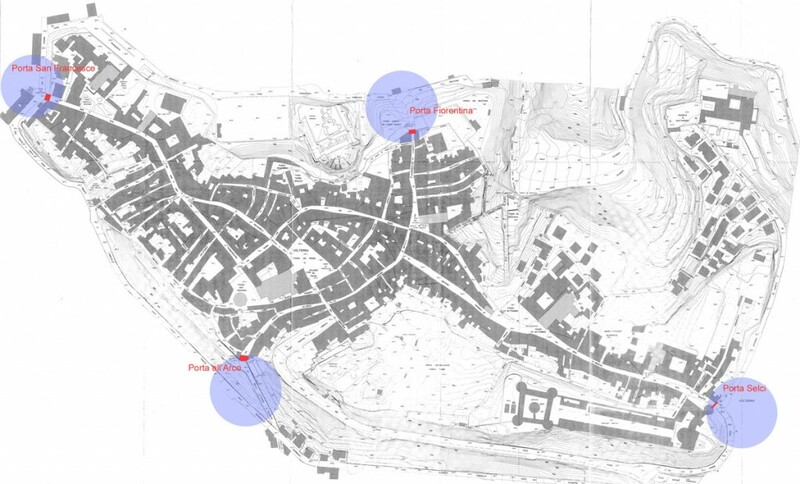 The workshop will concentrate on the four principal gates to Volterra: Porta all’Arco and Porta Fiorentina on the north-south axis of the city, as well as Porta Selci and Porta San Francesco on the east and west ends. The workshop participants will be divided into four teams, each of them composed of one professor and four students. Each team will work on one of the four sites. Each location is different, with its particular set of urban and historical conditions. Therefore each group will be able to define its own particular program, based on the site analysis and the general guidelines provided below. The definition of the exact boundaries of the project is also a responsibility of each team.